TOURISM IS AT THE BEGINNING OF A BOOM; there is a new professionalism in the way that Tanzania presents its very considerable tourist attractions to the outside world. After a very heated and rather negative campaign with much character assassination and many platitudes rather than policies, the Temeke by-election on October 6 nevertheless turned out to be free, fair and peaceful. The result astonished political commentators and greatly strengthened the position of NCCR-Mageuzi opposition leader and former Deputy Prime Minister, Augustine Mrema. Towards the end of the by-election the candidates of eight smaller parties began to accept the new reality and announced that they wished to withdraw from the contest in favour of Mr Mrema. Another indication of the beginnings of cooperation between opposition parties was the withdrawal on November 19 of an election petition in Hai district in Moshi by a CHADEMA candidate against an NCCR-Mageuzi MP. The CHADEMA representative said that the dispute presented a negative image of the opposition and that opposition parties needed to cooperate against the CCM. Many smaller parties had been hoping to receive government subsidies for the by-election but these were given only to parties which had won at least 5% of the votes in the general elections in 1995 – these were the CCM, NCCR-Mageuzi, CUF and CHADEMA. How did it happen? Although CCM brought in all its top people including, surprisingly, President Mkapa himself to support its candidate, most observers said that CCM’s campaign was poorly conducted; the government had had to remove the CCM controlled Dar es Salaam city council for general inefficiency and replace it by a government-appointed commission; there was much dissatisfaction about the mishandling of the elections in Dar es Salaam in 1995 – they had to be conducted twice; the budget had been unpopular: but, it was perhaps Mrema’s popular style and his characteristic demystification of the political process that had endeared him to the people. In the spirit of the new democracy Vice-President Dr. Omar Ali Juma congratulated Mr Mrema on his victory, and said that the government would give him maximum cooperation in his endeavour to bring about development in Temeke. And in the Mainland parliament itself relations between government and opposition MP’s are said to be cordial and the opposition is being constructive rather than destructive. Just prior to the Temeke campaign Mr Mrema was in South Africa. He praised National Party leader Frederick de Klerk and said that he had received a warm welcome from South African Home Affairs Minister and Inkatha leader Chief Mangosuthu Buthelezi. According to allegations reported in the Business Times the NCCR-Mageuzi party had received massive sums from the South African National and Inkatha parties during its 1995 election campaign. The CUF party was also alleged to be receiving funds from the Gulf and Scandinavia. Registrar of political parties George Liundi has said that there could be no objection to this foreign funding; CCM had been receiving assistance from China, Cuba and North Korea for decades. Two former government ministers have lost their seats in parliament following petitions to the High Court. They are the NCCR-Mageuzi MP for Bunda, Musoma, Mr Stephen Wassira and the CCM MP for Muhambwe in Kigoma Region, Mr Arcado Ntagazwa. It was former Prime Minister Joseph Warioba who petitioned against Wassira (the last election results gave Wassira 18,411 votes to Warioba’s 17,640). Mr Justice Lukangira said that there had been corrupt practices (Wassira had promised to issue sugar and salt to one village and had held parties in other villages), use of foul language to denigrate Warioba, and that there had been flouting of election rules and procedures. However, Justice Lukangira, in a controversial landmark decision, ruled that a determination that a person was guilty of corruption was not the same as a conviction for corruption, the former being a finding from a set of facts and the latter being an order consequent to the finding. Warioba has decided to appeal against this ruling so that the by-election originally scheduled for January 5 1997 had to be postponed because Wassira intended to stand. Mr Warioba would not be standing as he was joining the International Court of Justice. Former Minister of Natural Resources Arcado Ntagazwa lost his seat on the grounds that he was a foreigner born in Burundi and therefore not eligible to stand in Tanzanian elections. The purge of senior personnel started by President Mkapa following his inauguration last year continues and it is becoming apparent that the government is serious in doing something about the widespread corruption. According to the Daily News (September 3) the Finance Director of the Tanzania Cashewnut Board had been suspended for misuse of money meant for the Cashewnut Industry Development Fund and two other executives had been retired in the public interest. Eight officials of the Tanzania Electric Supply Company (TANESCO), including two deputy managing directors, were suspended in late September pending investigation of allegations of misappropriation of funds. A new board of directors has been appointed at the Kilombero Sugar Company: the General Manager has been retired and several line managers were demoted for disciplinary reasons. At the end of September it was announced that the Board of Directors of the National Housing Corporation (NHC) had dismissed two senior officials and demoted four others, all of whose names were published, for misappropriation of public funds and maladministration. On October 18 the Minister of Agriculture and Cooperatives was said by the Daily News to have confirmed that the Managing Director of the Tanzania Sisal Authority (which is to be privatised) was on suspension pending investigation of an alleged mismanagement of Shs 1 billion. On October 25 Health Minister Mrs Zakhia Meghji announced that she had ordered the transfer of seven officers from the Dar es Salaam port health office following accusations by importers that they were corrupt and inefficient. And the next day the Daily News main front page headline read ‘ATC Officials suspended’; it went on to say that ‘ almost the entire management of Air Tanzania Corporation (ATC) has been sent on forced leave to give room for auditors from Price Waterhouse to investigate the company’s accounts following an emergency meeting of the board of directors. The management was said not to have planned properly for the lease of an aircraft to replace the Boeing 737 ‘Serengeti’ which had to be sent away for service. The most recent development has been a reorganisation of CCM’s Youth wing and changes in top staff. In Zanzibar President Amour sacked the Unguja Central District Commissioner for failing to resolve a dispute amongst fishermen which had resulted in one death. But the most important sign that things have changed in Tanzania came on November 3 when Tanzania’s Finance Minister Professor Simon Mbilinyi announced his resignation after weeks of speculation. Minister of State (Planning) in the President’s Office Mr Daniel Yona was appointed Acting Minister of Finance. The problem had first come to light in parliament on August 2 when CCM MP Chrisant Mzindakaya demanded an explanation from the minister on a decision by his ministry to exempt four companies from paying an import tax of Shs 300 million (25% flat rate) – as laid down in the 1996/97 budget – on 5,500 tons of cooking oil. The matter soon became a major political issue and some MP’s demanded the minister’s resignation. Under great pressure from press and parliament Professor Mbilinyi announced on August 14 that he had reversed his decision. He had originally granted the exemptions, he said, because the goods arrived in the port before June 20, 1996 and that the exemptions were therefore proper. But this was questioned by others who said that taxes should be paid on the date they are cleared from customs control. NCCR leader Augustine Mrema lost no time in bringing the issue up in the Temeke by-election and openly accused Mbilinyi and other named persons in his ministry of having accepted Shs 900 million in bribes. On September 24 a parliamentary select committee, under the chairmanship of businessman/banker and CCM MP Iddi Simba, which had been set up to examine the allegations, issued a 42- page report. It recommended that the President should take action against the minister – he should be ‘made accountable’. The committee said that they had failed to prove that the professor had accepted any inducement but there was sufficient circumstantial evidence ‘which led the committee to make its decision’. Normal procedures had been flouted. Mr Simba also criticised Mr Mrema saying that his charges that certain persons had received Shs 900 million in bribes were based on forged documents. The Tanzania Oil Manufacturers Association categorically denied any underhand dealings with any government official but the minister finally resigned. President Mkapa’s press secretary said that he had resigned ‘to let state organs investigate allegations of corruption which had been made against him’ and ‘as a move to strengthen solidarity in the party and government’. On November 7 the National Assembly directed the government to investigate corruption charges against the Finance Minister and other CCM and government officials and report within six months~ the Attorney General should then take appropriate action. New MP, Mr Augustine Mrema, said that if the documents he had presented to the committee were to be further examined they should be examined by an international police body and not by Tanzanians. Britain is seemingly not alone in having a divided ruling party. According to the Business Times (August 16) there was another explanation of what was going on as regards Professor Mbilinyi. There was evidence of a conspiracy by a certain clique of people who had held senior positions in the previous government but who now sat as backbenchers in parliament to damage the Mkapa government by implicating the professor. New African (December) went further and quoted Professor Mbilinyi as saying that ‘the war being waged was not against him personally but against the whole government’. The article went on to name the ‘old guard’ of CCM members who were said to be against the Mkapa government ~ it named Select Committee Chairman Iddi Simba as well as former Prime Ministers John Malecela and Cleopa Msuya and even former President Mwinyi. An indication that there might be some truth in all this came when President Mkapa stated publicly, according to the East African (November 18), that there were divisions amongst the senior establishment of the CCM party which had interfered with his efforts to lead the country effectively. “If we don’t pull together now … CCM will have a poor record to show Tanzanians come the next elections in the year 2000” he was quoted as saying. On November 22 the Business Times reported that it believed that CCM was going to tighten up its control of its MP’s and insist on them supporting all bills presented by government to parliament. The day after the Mbilinyi probe report President Mkapa received the report of the committee set up to investigate the killing of Lt. General Imrani Kombe, the former chief of intelligence (see TA No 55). Fifty two witnesses had been interviewed. The report stated that the government was not involved in any way in the killing but the full report could not be released until court cases against the police officers involved had been completed. The report of the judicial commission investigating the loss of the MV Bukoba, which sank in Lake Victoria with the loss of 700 lives last May (TA No 55) was published on September 6 and spread the blame widely – the Tanzania Railways corporation’s Marine Division for operating the vessel without due care (it had a long-standing stability problem yet on its final voyage it was overloaded, there was improper storage of cargo and inadequate ballasting); the division was said to have been characterised by gross negligence , inefficiency and corruption; the government was blamed for buying a defective ship (although this was partially because of a lack of expertise on the Tanzanian side and the crisis in Lake shipping caused by the collapse at the time of the East African community’s Lake steamer services; this had placed Tanzania in a weak bargaining position with the suppliers); and the Belgian shipbuilders (BSC) for supplying a vessel which did not correspond to the specifications and for not giving the users adequate guidelines on the extremely delicate handling the ship required. The report also described as ‘regrettable’ the failure of the Belgian government to finance promised rehabilitation work on the ship. The Belgian government has since refused to pay compensation to the victims stating that the shipbuilders (who are believed to have gone out of business) were responsible. But the matter remained under discussion in the Belgian parliament. The Director of Public Prosecutions announced on November 27 that criminal charges were being prepared against a number of people in connection with the tragedy. Potential investors turned up in great numbers at two investment conferences, in Dar es Salaam (November 5-8) and London (November 6). The first, the Tanzania International Investment and Technology Forum, was sponsored by UNIDO and the second, which was devoted to East African cooperation, by the Financial Times. The Dar Forum was clearly very successful as it attracted $786 million in new investment from more than 400 foreign investors representing 220 companies. Four joint-venture contracts and 75 letters of intent were signed by local companies and state agencies with foreign partners. The investments were in gold mining, soap manufacture, oilseeds, a dairy plant, a petroleum pipeline from Dar es Salaam to Mwanza, a hydro-electric plant in Morogoro, diamond and gemstone mining, construction of hotels, shoe manufacturing, cutlery, cotton yarn, fruit juice manufacturing and coffee processing. But Tanzania came in for heavy criticism especially at the London seminar for the way in which its Investment Promotion Centre (IPC) treated investors compared with the warm welcome they received in Uganda. One British businessman called it the , Investment Prevention Centre’ because of its bureaucratic nature and negative attitude. Even the new IPC head, Mr Samuel Sitta, was quoted in the Express (September 12) as saying that he found the centre too tardy and riddled with red tape. Staff at the IPC seemed to love controlling rather than inviting new investment he said; some investors had to go to seven different offices with the same set of documents. At the London seminar Foreign Minister Jakwaya Kikwete put a lot of the blame on the IMF. It was the IMF that had insisted that tax exemptions could be approved only by the Ministry of Finance and not by a ‘one-stop’ investment centre. He felt that the situation would soon be resolved. But Mr Kikwete also pointed out that Tanzania was the largest country in East Africa in terms of size and population; it was better endowed with resources than the other two countries; it was stable, peaceful and had been cohesive since independence; it had just undergone a peaceful transition from a one-party to a multi-party system of government; there was plenty of land; the industrial sector was more or less virgin territory; there were numerous training facilities available for use by the private sector. President Mkapa, in a highly significant pro-private enterprise opening speech at the Dar es Salaam forum (delivered by Vice-President Dr. Omar Ali Juma) promised a much better deal for foreign investors. He said that the government planned to drop visa requirements for citizens of countries of ‘ strategic investment interest and trade importance to Tanzania’, and provide long-term work permits to foreign investors promptly. He said that he would restructure the IPC, would reduce bureaucracy, would streamline the taxation system, fight corruption and rationalise labour laws. He assured investors of protection, peace and stability, things which Tanzania had enjoyed since independence. British aid minister Baroness Chalker at the London seminar pointed out that corruption depended on two parties; investors should stop offering bribes. Regular visitors to the vast World Travel Market at Earls Court in London (November 11-14) were astonished to see the transformation in the scope and style of Tanzania’s stand. Among the African stands only that of South Africa was larger. Dynamic Natural Resources and Tourism Minister Juma Ngasongwa, having just returned from a similar assignment in South Africa, led a party of some 20 private companies who had arranged displays at the impressively laid out stand. Potential tourists were invited to hire a private yacht on the coast, to travel by private train, to flyover the Serengeti in a balloon, to watch birds or ride horse back and engage in a whole range of other activities. Tanzania’s 12 national parks, seven game reserves, 50 controlled areas, its conservation park, its marine park, beaches, historical sites and other attractions are now finally receiving significant international publicity. The minister had reacted forcefully immediately after an attack on two tourists in the Serengeti National Park on September 8. He announced that security patrols had been strengthened, the number of rangers at each lodge had been increased and those out on patrol had been instructed to shoot bandits on sight. A new helicopter would soon be helping with security in the park. A US$ 25 million film with a cast of 200 entitled ‘The Maasai’ and intended to further promote Tanzanian tourism is to be made in Arusha starting in May 1997. Uganda’s formidable President Museveni, on a state visit to Tanzania on September 21, lectured the Dar es Salaam business community on ways in which Tanzania could profit from Uganda’s highly successful experience with investment and revenue collection. “I understand that some people here don’t like Indians” he said. “They argue that they are corrupt and bribe the indigenous people. If the indigenous accept bribes from them they are stupid (applause) …. if you don’t want Indians here I’m ready to take them to Uganda ….. five years ago Uganda collected $40 million in taxes; this year I am expecting US$900 million …. suppose I had 1,000 Indians like Madhvani in Uganda, I would be generating US$36 billion annually in taxes and Uganda would become a donor nation!”. At another meeting in London on November 20, under the auspices of the Royal African Society, the three East African High Commissioners in London talked about East African cooperation. One speaker said that a possible future benefit of such cooperation might be the appointment of only one High Commissioner for the three countries! Tanzania’s High Commissioner Dr. Abdul-Kader Shareef put some flesh on the bones of the proposed cooperation arrangements now being actively discussed at the headquarters office in Arusha by describing some of the possibilities – an easing of previously restricted social interaction across borders; common strategies on foreign debt; the creation of a critical mass in terms of the market; cooperation on environmental issues – the Serengeti and the Maasai Mara were one continuous ecosystem; the pooling of telecommunications facilities; stemming the loss of professionals; the assembly of the huge capital requirements if energy resources were to be properly developed; and the advantage of a unified approach when dealing with the issue of instability in neighbouring countries. As if to reinforce the other favourable developments, Tanzania’s financial crisis was greatly eased by the decision on November 8 of the IMF finally to approve Tanzania’s Enhanced Structural Adjustment Facility (ESAF) totalling US$234 million. World Bank Resident Representative in Dar es Salaam Ron Brigish was quoted as saying that this could open the floodgates for balance of payments support and donor contributions to Tanzania’s development. Two weeks later the British government announced that it had approved a £24 million grant of programme aid for imports support, civil service reform costs and budgetary support. The IMF loan is to be released in six equal half-yearly instalments over a three year period. The funds are being used to boost foreign exchange reserves in the Central Bank to enable Tanzania to purchase urgently needed medical and educational supplies. 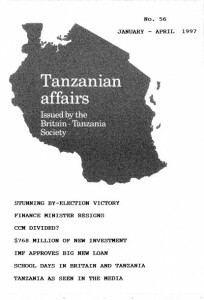 Tanzania was said to be hoping that a beginning might be made in new international debt relief programmes at the next Paris Club meeting scheduled to be held in January 1997. Although revenue collection had improved and was totalling Shs 44.3 billion each month, some Shs 20.0 billion of this had to be paid in debt servicing. with government personnel needing to be paid, only Shs 4.7 billion was left each month for all other expenditure although the minimum needed was Shs 15 billion per month. The World Bank announced on November 7 that it had established a ‘Heavily Indebted Poorest countries Trust Fund’ (HIPC) to be managed by the IDA to provide debt relief. Forty one countries being considered for possible assistance have been placed in four categories. Tanzania is in the second group i.e. ‘Possibly stressed’. Countries in the first group containing Burundi, Sudan and Zaire were described as ‘Unsustainable’. ‘Sustainable’ countries included Ghana, Kenya and Yemen. The valiant attempt by Commonwealth Secretary-Secretary General Chief Emeka Anyaoku to resolve the political deadlock in Zanzibar (TA No. 55) appears to have failed. Apparently a compromise agreement was worked out under which certain members of the opposition CUF party would have joined Zanzibar’s CCM government, but this did not prove acceptable to entrenched party interests. Meanwhile the tension was eased when CUF leader Seif Shariff Hamad was finally allowed to address a meeting at Malindi grounds in Unguja on August 17 – the first time since the elections in late 1995. He suggested the creation of a transitional government to be headed by a neutral Zanzibari acceptable to both parties prior to the holding of new elections. The Daily News reported that police arrested 25 CUF supporters on September 17 a few kilometres outside Zanzibar town for unlawful assembly. They were watching a video of the CUF by-election campaign in Temeke and were later released pending further investigations. Some 200 teachers who were alleged to have ordered their students to boycott classes in Pemba last March have been pardoned. The state of the 32-year old Union between the then Tanganyika and Zanzibar dominated discussions on August 19 in the Union parliament when opposition MP’s insisted that the Union was illegal because the original articles were never ratified by either parliament. But this was denied by Attorney-General Andrew Chenge who said that on April 25 1964 both the Tanganyika parliament and the Zanzibar Revolutionary Council had agreed to the new constitutional arrangement. The opposition went on to ask for a referendum to determine the future of the Union. On complaints that Zanzibar was over represented in the union parliament Mr Chenge said that, although Zanzibar had only 700,000 people compared to 29 million on the Mainland, both sides had been independent and sovereign states; they were united on the basis of equality as sovereign states and not on the basis of the size of the population. Meanwhile, Zanzibar has established its own Revenue Board even though the carefully constructed and well financed Tanzania Revenue Authority (TRA), created under a 1995 Act of the Union parliament, has only recently started operating. The TRA seeks to harmonise tariffs between the two sides but this is something which is also being strongly resisted by Zanzibar which benefits from its lower tariffs. In a sometimes heated debate on a proposed joint finance commission, a Zanzibar CCM MP (Mr Simai Makame) developed the argument further by saying that there should be equal representation of both parties on the commission to strengthen the Union; also because the mainland had far more sources of income than the Isles and that heavy taxes were appropriate for the mainland to protect local industry but not for the Isles because they had little industry. One of the financial problems being faced by Zanzibar, following the cut off of aid by many donor nations because of alleged abuse of human rights, is being greatly eased under an arrangement described in the East African on September 9. Revenue collected by the Union government, including that received from foreign aid and profits of the Central Bank, is to be split in future in the proportion 95.5% to the Mainland and 4.5% to Zanzibar. Some 60 delegates at a two-day conference of lawyers, government and political leaders in Dar es Salaam in late November recommended that the Tanganyika Law society should draft a new Union constitution. The sole resolution called on the society to immediately embark on mobilisation of resources to re-write the basic law of the land. The Friedrick Ebert Stiftung of Germany agreed to provide financial assistance. Former CCM Secretary-General Horace Kolimba surprised delegates by saying that the time could never be more opportune than now to undertake such a task; CCM had always denied the need for a new constitution. Registrar of political Societies George Liundi also agreed on the need. A further group of 27 British VSO volunteers arrived in Tanzania in August bringing the total number to 100 in the country. They included teachers, agricultural specialists, social workers, pharmacists, technicians, accountants and educators. A year after the UN’s fourth World Conference on Women held in Beijing, Susan Kindervatter of the non-profit ‘Inter Action Coalition’ said on August 22 that Tanzania was clearly in the running for a gold medal as far as implementation of the resolutions of the conference was concerned. Tanzania had presented one of the most comprehensive lists of commitments and was already taking action to increase the number of women in governmental decision-making positions to a minimum of 30% by the year 2,000 she said. The other front runners were the Philippines and Uganda – The Express, Dar es salaam. The celebrated Dar es Salaam ‘Little Theatre’ which has seen many fine performances over several decades, will shortly be converted into an apartment hotel with 48 flats, swimming pool, bar and restaurant and conference facilities. Investors include players and actors of the theatre – Business Times. WHICH ARE THE HISTORIC BUILDINGS? In the last issue of TA there was an article headed ‘The Demolition of Dar’. On September 15 a Mr Mchume wrote to the Daily News on the same subject. He deplored the planned transformation of Dar es Salaam into a concrete jungle and listed the buildings he thought should be preserved. These included the Cosy Cafe, The White Fathers building, St. Joseph’s Cathedral, the Arab Mosque, the British Council Library, Ocean Road Hospital, the Forodhani Hotel, the Lutheran Church and the Botanic Gardens. There were many others he said. Anne Outwater writing in the Daily News (October 19) reported that for the chimpanzees at the Gombe Stream National Park 1996 had been a terrible year. Following cold and rainy weather in March many chimps had come down with serious respiratory infections and one third of the population of about 30 were reported either dead or missing. The regional veterinarian had recommended daily antibiotic treatment but getting the chimps to take the pills proved difficult. So each pill was divided into six or seven bananas and “luckily, chimps never get tired of bananas”.